It’s been a weekend the goalkeepers would rather forget in the National Premier Leagues, with 37 goals scored in seven games across the Sunshine State. 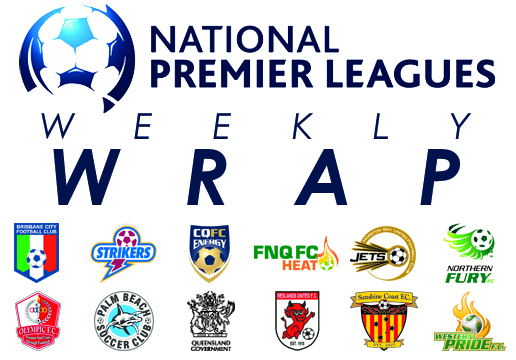 Review all the weekend action in the weekly wrap. Sunshine Coast Fire claimed bragging rights in the first ever NPL coastal derby on Thursday afternoon, defeating Palm Beach Sharks 3-1 at Mallawa Sports Complex in a rescheduled Round 5 fixture. Jeremy Lynch netted either side of half time for the Fire – his first goals since his side’s opening round rout of CQFC Energy –before Paul Arnison sealed the result from the penalty spot midway through the second stanza. The opener came when Arnison split the Sharks backline with a deft through ball for Wayne Knight, the right midfielder immediately squaring a pass back to Lynch who finished firmly from the top of the area. Lynch once again was ‘Johnny-on-the-spot’ for Fire’s second, tapping in from close range after left-winger Nico Bechar drew out Sharks keeper Ryan Meskell, the Frenchman unselfishly teeing up his younger team-mate for the simple finish. Arnison received just reward for a busy performance midway through the second half, converting from the penalty spot with 22 minutes remaining after Bechar was felled inside the area on the turn. Sharks scored a consolation with six minutes to play courtesy of Jarrod Kyle’s powerful header, however it proved too little too late for the hosts, who are winless in their past four fixtures. The two coastal teams will renew their burgeoning rivalry in July in a Round 16 clash to be played at Sunshine Coast Stadium. Brisbane City have recorded their fourth win in a row, following an unconvincing 2-0 victory over a ten man Queensland Academy of Sport at Wolter Park on Saturday afternoon. Star striker Antonio Murray once again did the damage for City, continuing his recent scoring form with a brace to lift his personal tally to 11 for the season. The result somewhat flattered Brisbane City, who were fortunate not to go in behind at the break after QAS had the better of the opening half – the youngsters unable to make repeated attacking forays count on the scoreboard. The opening goal came courtesy of an inspired run from Matt Biggins, the attacking midfielder dancing through the heart of the Academy defence before laying the ball for Murray, who finished with his now customary confidence. QAS immediately sought a reply, however their cause was hindered when Peter Roditis was given his marching orders for a second bookable offence just prior to the hour mark. The extra man saw City take control, Murray netting his second not long after the dismissal when he plucked Thomas Shannon’s long range effort out of the air, turning and firing home from near the penalty spot. QAS continued to push for a goal, getting in behind City’s defence on several occasions in the closing stages, only to be repeatedly denied by the linesman’s flag. The result sees QAS remain at the foot of the NPL table, while City stay in touch with the top four in fifth with a game still in hand. Far North Queensland FC Heat have ended a difficult month on a positive note, defeating Moreton Bay United 3-2 at Wolter Park on Saturday evening to lift the Cairns-based side to eighth on the NPL table. FNQ FC stunned the Jets from the kick-off, sensationally taking the lead inside the first minute of the match when midfielder Tom Murphy fired a scorching first time strike from long range. The fast-paced contest offered chances for both sides before Heat extended their lead on 27 minutes, Josh Jennison’s header rebounding off the crossbar for the lurking Justin Sabbadin, who steered the ball in to the back of the net on the volley. Buoyed by a vocal home crowd, Jets responded with two goals in four minutes to restore parity – Joshua South capitalising on a goal-keeping error for the first, the second coming from Michael McEvoy’s benign 30 yard free kick that inexplicably evaded the attentions of a raft of defenders before bouncing in off the far post. Jamie Carroll restored Heat’s advantage following the restart, running on to a sharp cut back from left-winger Matt Murphy to drive his shot home from the top of the area. A grandstand finale ensued, with several Jets attacking forays denied by desperate defending and a series of saves from young Heat goalkeeper Anthony Zecchinati on debut. In a controversial conclusion, Jets saw several passionate penalty pleas turned down by referee Jason Crow late in the second half as well as seeing a goal disallowed for offside with two minutes remaining. Olympic FC extended their undefeated start of the season to seven games on Saturday night in Rockhampton when they dismantled CQFC Energy 9-3 at Rugby Park. Six players scored for Olympic in the rout, but it was a hat-trick from former Brisbane Roar striker Tim Smits that sealed the result for the league leaders after a see-sawing opening half. Jai Ingham gave the visitors a flying start when he turned in Danny Byrne’s cross in only the second minute. Soon after Ross Archibald replicated his spectacular long range effort from last round, doubling the lead from 25 yards with a blistering strike. The contest remained in the balance for the rest of the half – Energy edged closer through Sander Waterland, before conceding an own goal, only to bounce back almost immediately courtesy of Chris Geddes’ penalty. Smits first goal restored Olympic’s two goal advantage just prior to the break – the prolific striker calmly slotting a shot from 10 yards out. The second half was all Olympic however, captain Byrne spectacularly extending the visitor’s advantage when he flicked the ball over his head to create space, then curled his shot into the corner of the goal. Substitute Carl Tabulo added another for the visitors from a free-kick on 20 yards before Smits scored twice in 6 minutes to secure his hat-trick, taking his personal tally to 11 goals this season. Substitute Matt Heath got in on the act late, chipping the keeper for his first goal of the season, before Jordan Miller’s consolation penalty closed out the twelve goal feast. A scare was put through the Energy camp early in the second half when goalkeeper Tim English was taken to hospital following a collision with teammate Matteson Maguire, Energy officials later confirming English was cleared of serious injury. Sunshine Coast Fire claimed their second win in four days on Sunday, defeating the in-form Northern Fury 2-1 at Sunshine Coast Stadium to maintain their place in the NPL top four. Left-winger Nico Bechar was the star for Fire, setting up Leon Dwyer’s first minute opener with a well-timed run before netting the decisive goal with ten minutes remaining to seal the points for the hosts. Fire opened accounts almost from the kick-off when Paul Arnison spotted Bechar’s burst down the left, the Frenchman’s ensuing cross deflecting into the path of Dwyer, who tapped in from close range. Fire held the advantage til the break, before Jake Navarro levelled terms four minutes after the restart when he rose high at the far post to nod home Reyze Kelly’s pin-point cross. Both sides spurred chances to take the lead before Bechar popped up again for his third goal of the season – capitalising on a Fury defensive error brought about from defensive pressure from Chris Toovey. The loss is Northern Fury’s first since the Easter break and sees the Townsville-based club fall to sixth on the NPL ladder, two points adrift of the Brisbane City in outright fifth. Brisbane Strikers recorded their fourth straight win on Sunday afternoon with a hard-fought 4-0 defeat of a ten-man Western Pride in a bruising encounter at North Ipswich Reserve. Pride player-coach Kasey Wehrman was sent off in the first half for the hosts, the former Strikers NSL player holding nothing back against his former club in an ill-timed challenge on Greg King. Star striker Matt Thurtell was also stretchered off for Brisbane prior to half-time following a heavy challenge from Aaron Christensen, last season’s QSL golden boot Thurtell expected to be out for several weeks. Strikers opened the scoring on ten minutes when Thurtell controlled King’s pass with his chest before firing home on the volley. King then extended the lead following the dismissal of Wehrman, running on to Josh McVey’s early through-ball before calmly dinking his shot over Pride goalkeeper Steve Purdy. Pride continued to impose themselves physically on their opposition, however the plan came unstuck when the hosts conceded a free kick on 25 yards – Jonti Richter dipping his shot over the wall from the subsequent set piece. Substitutes Josh De Nittis and Josh Taylor combined to seal the result on 72 minutes for the visitors– de Nittis playing in Taylor who placed his shot confidently in an encouraging sign for Strikers head coach David Large who will call upon his reserves to replace Thurtell in coming weeks. 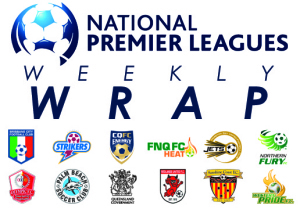 The result keeps Strikers in third place on the NPL table, level on points with Redlands United and one point shy of competition leaders Olympic FC. Palm Beach Sharks lost their third game in eight days on Sunday afternoon, falling 7-4 at home to Redlands United in a high-scoring conclusion to round 7 of the National Premier Leagues at Mallawa Sports Complex. Redlands controlled the match from the outset, and held a four goal advantage at the half, with Sharks only saving face with three goals in the final ten minutes. Reuben Way opened accounts for the Devils two minutes in to the contest, but it wasn’t til the half hour mark that Cleveland-based side made their advantage tell on the scoreboard, with George Barbarouses and Graham Fyfe extending the lead with two goals in quick time. Way netted a second to effectively seal the result before half time – the goal taking the 22 year old’s season tally to eight for the campaign. Fyfe added another just before the hour, curling a firmly struck free-kick in from 25 yards, before sealing his hat-trick from the penalty spot in the final ten minutes. Jheison Macuace again demonstrated his ability to craft a goal out of nothing, beating four defenders before slotting a well-taken shot in to bottom corner for his fourth goal in three weeks. With the three points secured, Redlands head coach Matt Chandler took the opportunity to blood younger players in the final minutes, Palm Beach taking advantage of the changes to score three goals in the final ten minutes – Chris Lucas netting a consolation brace for the hosts to extend his season tally to five goals. The result sees Redlands continue to nip at the heels of league leaders Olympic FC, while Palm Beach Sharks remain mired in the bottom half of the table with only a single competition point to show for the month of April.